And since that day, it’s all been downhill from there for us! And that nation is Israel! Literally everything this country has done since Bush stole the White House has been done thru and by Israel. That means every law, every tax; every piece of totally bogus legislation was enacted by the enemies of this country. The president is not an American. The Vice-President is on video screaming his love for being Zionist. Almost all of the congress has shown support for if not membership in AIPAC. The so-called Supreme Court has some very ugly direct associations with Zionists and this has collectively made this nation the victim, on a massive scale, to foreign agents of the hostile power that is known as Israel. 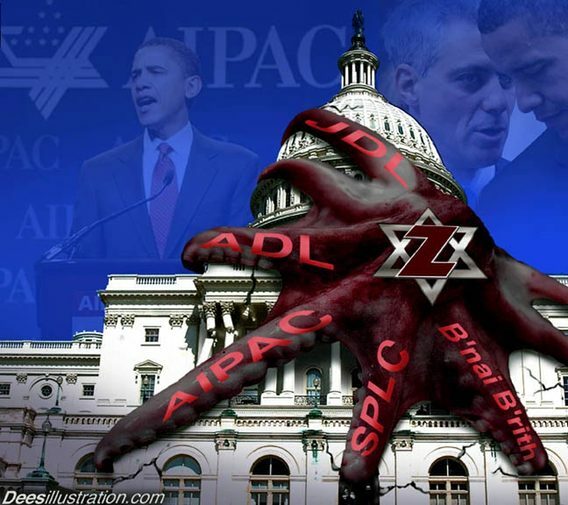 Our lawmakers are not American in the strict sense of that term; our officers of the government are Zionists or Zionist-affiliated agents that serve Israel. Our foreign affairs and diplomatic services, the State Department and the War Department are dominated entirely by Zionists. The media is owned by Zionists and many of their key on-air people are directly answering to Zionists. The Pentagon, the security services, and most of the secret government services agents are Zionists or answer directly to them. The list is literally endless. The Bankers, the upper-echelon of all the major corporations, the energy companies, the regulatory agencies, Big Pharma, The Hospitals, the Insurance Companies, there is almost no sector whether public or private that has not been infected by Zionists. Our police are trained in Israel and taught to treat us like Palestinians in Gaza. Our textbooks are contaminated with Zionist propaganda; the entire profession of psychiatry and a large percentage of people in psychology are connected with Zionism. Anything that gets really big in terms of corporate business must be connected with Zionists to survive. Consequently, it is clear that Americans are no longer in charge of their own country and haven’t been for a very long, long, time! Our wars are not our own. Our money is not our own: That too is owned by Israel through the Rothschilds and their global banking system. The IMF, The Bank of International Settlements, The World Bank, all of that is now criminally serving Zionist interests, even though on record America owns them all. The UN, NATO, and many of the alphabet agencies are so directly connected to Zion that it’s often difficult to tell their policies from those of Israel proper. The North American Union is another Zionist scheme along with terminating the 50 states and subdividing the US into Roman Numeral sectors. 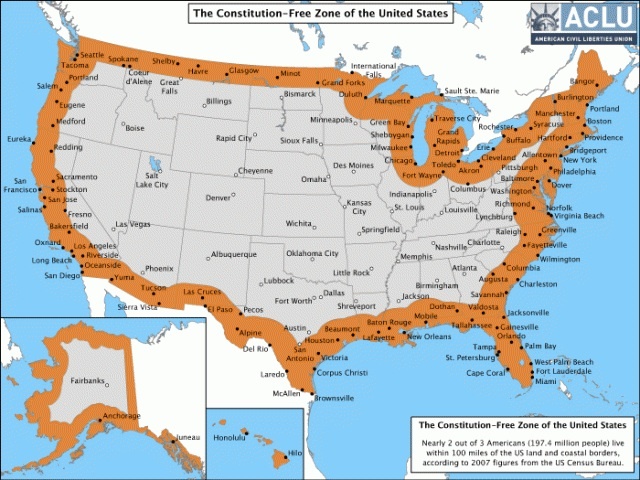 The same is true of the 100 mile wide “Constitution-Free Zone” that now runs all around the US, Alaska & Hawaii. The United States Constitution no longer protects the entire nation. As a threat to the national security of the United States. New York, Allentown, Bridgeport, Hartford, Providence, Boston, Manchester, Portland, Bangor, Syracuse, Rochester, Buffalo, Erie, Cleveland, Akron, Pittsburg, Columbus, Toledo, Detroit, Traverse City, Grand Rapids, Fort Wayne, Chicago, Milwaukee, Sheboygan, Green Bay, Marquette, Duluth, Grand Forks, Minot, Glasgow, Havre, Shelby, Spokane. Without the Constitution there is no law. Americans must begin to realize the truth. Almost none of the agencies or office holders here are actually being held by Americans. The police are shin bet trainees, and thugs who are trained to kill - not to protect Americans. The endless wars that Cheney-Bush enlisted us into are not wars that threaten America, they are all about crushing nations that Israel wants to add to that pathetic misery they call Israel. Israel is the enemy of the entire planet, but has so-far hidden the fact that they have infiltrated virtually every major nation, with a few very large exceptions (Russia & China come to mind). This is a war for the survival of mankind, and has nothing to do with “Anti-Semitism”, race-hatred, or any of the more traditional screams that Israel insists are how the world sees Israel. What other nation internationally tries to forbid the world’s community of researchers from examining the history of their country? What other country wants to pass world-wide laws to keep other people from hating them? Only Israel goes to that extreme—probably because they know how much they will be hated, once the world understands just how many countries their spies have already managed to infiltrate - having lied about their true allegiances? Once the people of the United States begin to understand the enormity of this infection and subversion by Israel, then and only then will that “CHANGE” what Nero so callously promised the people ­ would really begin to happen.